William R. Milnes Jr. won't be getting any more money out of Blue Cross Blue Shield of Vermont. At least, not anytime soon. A federal judge has dimissed a lawsuit filed by the HMO's former chief executive officer that sought an additional $575,000 in retirement pay. 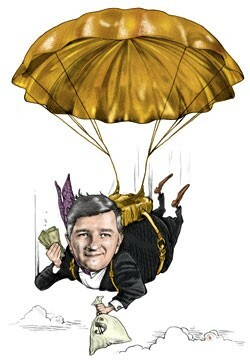 Readers will remember Milnes as the Blue Cross exec who departed the company with a jaw-dropping $7.2 million golden parachute in 2008. State insurance regulators ruled in 2009 that the pay package was excessive under state insurance law, and ordered Blue Cross to reimburse $3 million of that sum to subscribers in the form of lower rates. In the aftermath, Milnes moved to Florida. But he resurfaced in Vermont last year when he sued Blue Cross in federal court for another $575,000 in retirement pay — plus $200,000 in interest — that he said the company still owed him. Last week, U.S. District Judge J. Garvan Murtha ruled that Blue Cross doesn't have to pay it. The company would be in violation of that same insurance law barring excessive compensation if it awarded the $575,000 to Milnes, the judge ruled. Murtha also said the "impracticability doctrine" excuses Blue Cross from meeting its contractual obligation to Milnes. "Mr. Milnes would have BCBSVT pay him additional compensation above and beyond the amount already ruled excessive," Murtha wrote in the 18-page decision. "Although due to Mr. Milnes following his retirement, these payments reward work performed during the same years BISCHA ruled he received excessive compensation." BISHCA refers to the the Vermont Department of Banking, Insurance, Securities and Health Care — since renamed the Department of Financial Regulation — the government agency that investigated and ultimately sanctioned Blue Cross for paying Milnes' golden parachute. Milnes' retirement package sparked a political firestorm when it came to light in 2009, prompting Blue Cross to withhold the $575,000 in compensation it had not yet paid out to Milnes. In the ensuing lawsuit by Milnes, Blue Cross dredged up personal details about the former CEO's failing health and sought his medical records to show a 2007 stroke left him unable to perform his job duties. The HMO also subpoenaed Milnes' wife and personal financial adviser to testify about his motivations for retirement — a tactic Milnes' lawyers describe as a "fishing expedition" meant to harass and embarrass their client. Milnes' lawyers also disputed the fitness-for-duty allegation by noting that Blue Cross extended Milnes' employment contract and raised his base salary from $475,000 to $525,000 a year after the stroke. In a statement, Blue Cross vice president for external affairs Kevin Goddard reacted to the court ruling, saying, "We are pleased with the judge's decision that this issue has been resolved." Goddard did not respond to further questions. Milnes' lawyer, David Pocius of the Burlington firm Paul Frank + Collins, said in an emailed statement: "We're still reviewing the decision and have no comment at this time. In light of the appeal deadline — 30 days out — there has been no decision on whether Mr. Milnes will appeal." In other words, this case ain't over yet. And Blue Cross might want to keep its checkbook handy.